You hear a lot of scary stories about people contracting illnesses which have been linked to undercooked chicken and unfortunately the results of eating n undercooked one can be severe and even fatal. The problem is often that if you cook a chicken after defrosting, it may require a longer cooking time. 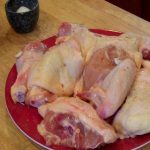 Cooking in a microwave can be tricky as often I have found, the chicken is still raw close to the bone. You should avoid eating chicken meat which looks bloody. However smoked chicken may remain pink even hen thoroughly cooked, so checking only the color is not recommended. Chicken can often contain the bacteria Staphylococcus aurea, and this can cause food poisoning. The problem with this strain of bacteria is that it has become resistant to certain antibiotics including penicillin. 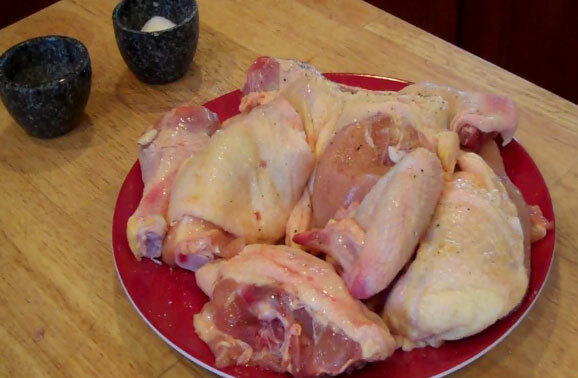 Salmonella food poisoning outbreaks are also associated with chicken, and the meat can be infected by human handlers. This can cause a variety of symptoms and cause osteomylitis, where bones are infected, pericarditis which occurs when the bacteria attack the sac surrounding the heart, meningitis when the brain or spinal cord are infected, and hepatitis which is a liver disease, and pneumonia, a lung problem. Salmonella typhi bacteria can be the cause of typhoid fever too. However the symptoms of salmonella poisoning are usually milder with vomiting, nausea and diarrhoea, stomach cramps and these usually only last for one or two days. Another bacterium which can be present in undercooked chicken is campylobacter which can lad to Guillain-Barre syndrome, which is a temporary paralysis which begins in the feet (you experience a tingling sensation) and moves upwards. This can cause complete paralysis, although this is usually temporary but may result in some weakness which will remain. Chicken nuggets have recently caused outbreaks of food poisoning, perhaps because people eat them raw or do not realize that they are undercooked because they are coated in breadcrumbs and bite-sized – by the time you realize they are not properly cooked, it is probably too late. If you buy chicken products, then read the cooking instructions carefully and follow them to the letter to avoid any illnesses related to undercooked chicken. It’ so easy to get it right that you shouldn’t be alarmed by the food poisoning stories you hear. Chicken is safe to eat as long as you cook it thoroughly. http://www.herbs-treatandtaste.blogspot.com If you found this article interesting you might like this website, as it contains information about the food we eat and the plants we can use to stay healthy. There are also easy to follow delicious recipes that are usually a fusion of western and eastern cuisines. Why not click on the link and see what it is all about for yourself? Charcoal 101 – Ever try to cook right on the coals? We risk a few nice steaks to test it out. Fire it up.